I had the privilege of attending a conference this past weekend called Current for Women. The premise of the entire event was to create an intimate atmosphere that would provide a safe and dedicated place to worship and hear from God. They made this happen by putting a lot of effort into the lighting, the music, and highlighting all the senses. I think my enthusiasm about this opportunity was a bit infectious, and I was happy to find myself with three other kindreds in a car headed down to Visalia last Friday evening. While driving down to the conference, all of us shared a word that described what we were hoping for over the two days. Mine was "Refresh." I have just been tired in pretty much every aspect of my life. I had this sense that I was coming close to the edge of exhaustion. But, more than anything, I had this overwhelming need to be refreshed in my spirit and be recharged for the coming weeks and months. So, on Friday night, I was eager to participate in many of the stations available designed to provide a place to read an excerpt and either journal, pray or do some type of activity designed to help us go deeper and go further in our walk with the Lord. I especially enjoyed one about tears that was very thought-provoking for me ("Tears = Liquid Prayer"). 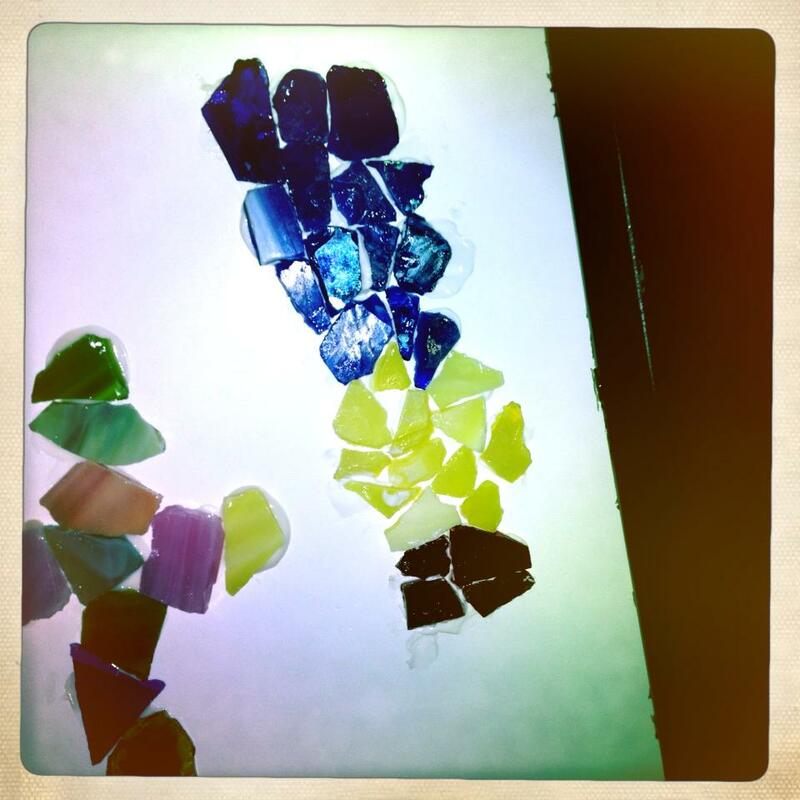 And of course, I had to do the Mosaic Station about Brokenness and how we let God take those broken pieces and create something new and beautiful. They had me at the top quote by Ann Voskamp. Getting to create my own mosaic on a big canvas was the icing on the cake. 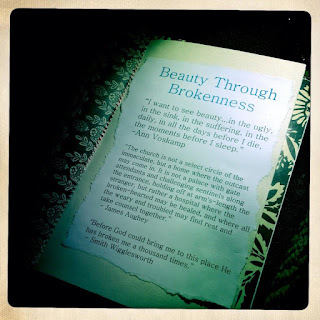 Mine is pictured at the top of this blog and I knew that it was to be called, "Trials Turned to Gold," because if I know anything at all, I know that God has miraculously turned the worst trials and pain of my life into gold. However, I gave the Foot Washing station a wide berth. But as the night went on, I just knew that I was supposed to go and do it, but really resisted the idea of being served by having my feet washed. So when I finally broke down and walked over to it, the sweet lady told me to read the beautiful sign in front of me and choose a word. 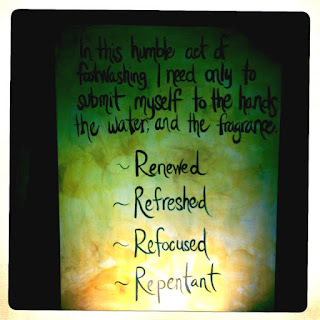 As my gaze graced the beautifully painted sign (another Sarah masterpiece), I saw "Refreshed", and I cried. 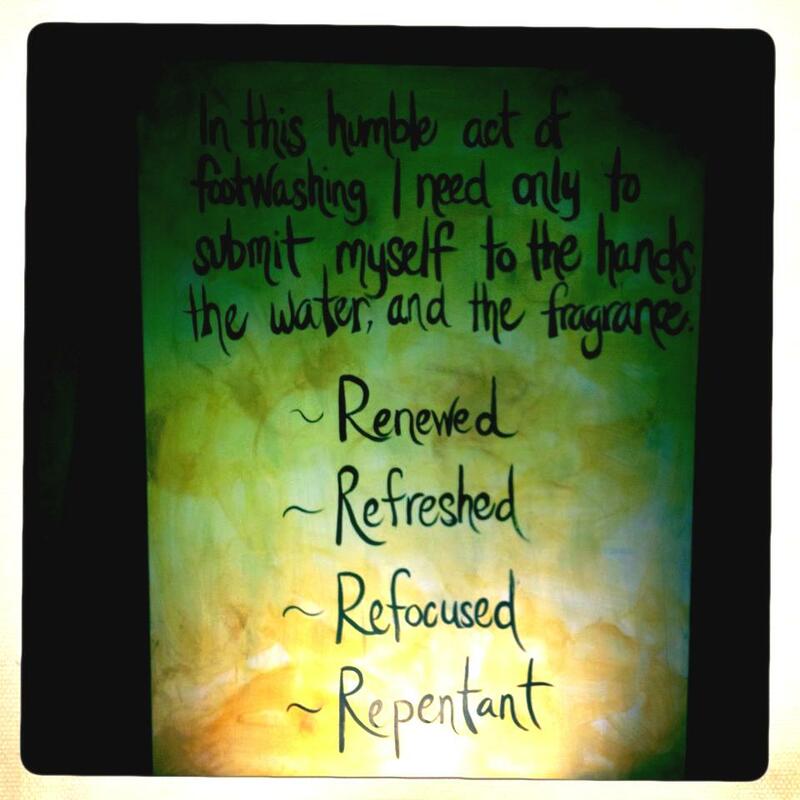 Needless to say, I continued to cry throughout the process of washing my mommy-weary feet, and as she prayed a beautiful prayer over me with this theme. "You will stand strengthened by the nourishment of the Word, Water and breath of life. In the depths of your spirit I pray you have the eternal refreshing of the Spirit of God flow through you whenever you look to Jesus." Lesson learned....when God tells you to do something...even if it's something you really don't want to do....you do it. Because He knows what we need and we don't. Not always. Maybe not usually. The rest of the conference was amazing. But, truly, at this point, I was full! And yes, I was feeling pretty refreshed at this point. So, the rest was just more...and more...and more! The theme was "Chosen," and God really orchestrated some amazing moments for dear friends of mine who came with me and were blown away when the first video story (one of many) started to play about a local family who had adopted a child. It could have not been more perfect for them....they intend to adopt children some day...and maybe soon. Yet, it was profound for the rest of us too. Do you know the freedom that comes when you understand that you are a beloved daughter (or son)-- not a slave or a robot -- that you have been lovingly and purposeful adopted? "For you did not receive a spirit of slavery to fall back into fear, but you received the Spirit of adoption, by whom we cry out, 'Abba Father!'" And I felt that same lightening bolt when our speaker, Jill, shared the simple truth that while there can be accidental conception, there is never an accidental adoption. Adoption is always with full intent and purpose. The cherry on top was when the worship team continued to play and sing and my kindreds and I stayed behind to just soak it in. The song selection was incredible. At first, I had to laugh about 3 songs into it because it was so tailor-made for one of my beauties. I called it "Suzanne's Playlist". I know that you have come now,even if to write upon my heart,to remind me of who You Are..."
But that line..."even in my weakness"....(and dare I say, especially in my weakness)...destroyed me...in a good way. And shined a light on why I so desperately wanted to feel....new. He did choose me, and I'm still trying to wrap my very human-sized brain around that universally-big notion. "And having chosen them, he called them to come to him. And having called them, he gave them right standing with himself. And having given them right standing, he gave them his glory."